Some bills favorable to the collision repair industry have been introduced in the Northeast. One moving through the New Jersey Assembly and a nearly identical one in New York level the playing field between dealerships and independent repairers, requiring original equipment manufacturers to give all auto body shops the same repair data as they give their own dealers. The New Jersey and New York bills require that OEMs share repair procedures and details for model years 2002 and later. By the 2018 model year, they’ll be required to allow nondealerships to access on-board diagnostics with an “off-the-shelf personal computer” meeting a manufacturer’s specs. Oddly, RV manufacturers are exempt from the New Jersey bill. Alliance of Automotive Service Providers/New Jersey Executive Director Charles Bryant, who was on his way to the Northeast show when reached Thursday, said collision repairers had “fought for years” to get something like it passed, with no success. Then Massachusetts voters OK’d the similar Question 1 in 2012, and the OEMs agreed to a memorandum of understanding that they’d share that type of information nationwide, according to Bryant. It would seem to a laymen that the problem was fixed, Bryant said, but “we don’t think so.” Having this policy codified into law would be better for an extra layer of protection, according to Bryant. “It’s getting better, but it’s still not like it should be,” Bryant said. The New Jersey bill, A. 230, passed the Consumer Affairs Committee 3-2 on Monday; an earlier version passed the Assembly in 2013 but died in the Senate. Democratic Assemblymen Patrick Diegnan Jr., Charles Mainor and Paul Moriarty — a co-sponsor of the bill and the committee chairman — were in favor; Republicans Sean Kean and Allison McHose were opposed. A companion to the new bill, S. 829, was sent to the Senate Commerce Committee in January 2014. Unfortunately, it was sponsored by former state Sen. Donald Norcross, who is now a Democratic U.S. representative and obviously unavailable to seriously push for it in the Capitol. A. 4066 in New York, sponsored by Democratic Assemblyman Michael DenDekker, was sent to the Assembly Transportation Committee on Jan. 29. There doesn’t appear to be a Senate version filed. Breaking the New Jersey law could carry a $10,000-$20,000 fine as well as other punishment, according to Moriarty and co-sponsor Assemblyman Reed Gusciora. The New York law seems to simply allow injured body shops to sue the insurers or get $50, whichever ends up being greater. Washington, D.C., ASA representative Bob Redding has also written to Moriarty that the bill would yield “more government bureaucracy, more regulation and more litigation,” according to the group. A message left Thursday afternoon with the New York State Auto Collision Technicians Association was unreturned. 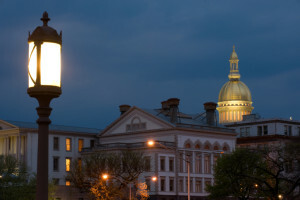 Be heard: New Jersey lawmaker contact information can be found here. New York Senate contact information can be found here and Assembly information here. But the bill’s broadness might be a sticking point, opening the door beyond interested parties like collision repairers, auto glass repairers and independent appraisers to plaintiffs with zero stake in how an insurer does business. Some sort of refinement or “reasonable person” test might give the bill a better chance of success. The bill will be considered by the House Corporations Committee at the “Rise of the House,” which is the end of the regular House session. The committee could meet around 4:30-5 p.m., a staffer estimated, but it really varies on how much business the full House — which meets at 4 p.m. — has on its plate that day. Also on the agenda for the Rhode Island Assembly Corporations Committee on Tuesday is House Bill 5491, which would create two tiers of auto body shops recognized by the state, “Class A” and “Class B” — and require insurers to provide different labor rate surveys for both levels. Read our earlier analysis of it here. Another Rhode Island bill that sounded promising has been withdrawn at the request of at least one sponsor for unknown reasons. House Bill 2484 would have prevented an insurer using non-OEM parts without written consent on every part that isn’t glass. Read our analysis here. Attempts to contact the Auto Body Association of Rhode Island for comment were unsuccessful.